Tuesday afternoon saw light drizzle becoming rain about 6pm. We were camped in our tents by then and it was nothing more than an annoyance. Wednesday began with awesome blue skys and cool weather, perfect for hiking. Sadly, it didn’t last. By 10 am the hail started. 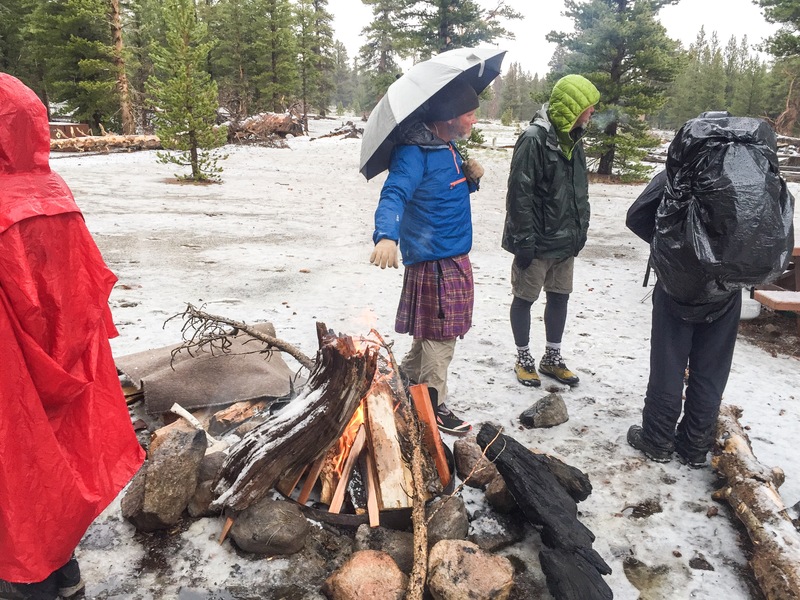 We were at 10,000ft and the light hail continued to dog us all afternoon. We reached Trail Pass and descended to Horseshoe Meadows where we were to meet Floyd (Turtles brother) who has our Bear Canisters and food. The storm intensified and really opened up as we arrived. The Lightning was intense! Nothing like having lightening strike within 50ft to wake you up. Turtle and his nephew had a bolt hit the ground between them as they were hiking. The high valley received so much rain and hail that it looked like snow and there was standing water everywhere. We couldn’t even find spots to pitch tents, so we threw in the towel and drove into Lone Pine for the night to dry off. It looks like today will be a repeat of Wednesday, so we don’t know when we will be back on the trail. The group will discuss our plans later today. Pictures: Here we started a fire to drive away the chill. Bill (Marilyn) and Skip (Professor) looking wet. Here is the whole group in a restaurant waiting to eat a lunch/dinner. We didn’t get settled into our rooms until after 8pm. It was a long and exhausting day. Yikes – you guys got blasted! 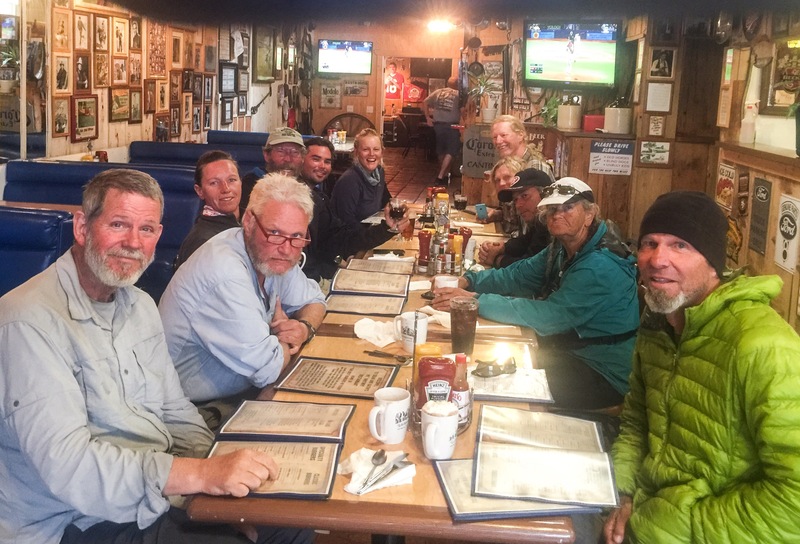 We’ve been tracking the weather and “our gang” from LA – how did anyone do the PCT without satellite tracking??? (I’m sure Mother Goose could render some opinions about that!) Not sure if the snow a few weeks ago or these conditions are preferable. So glad you all are safe in Lone Pine. Margie’s Merry-Go-Round is pretty good food, as is the coffee place on the opposite side of the street. I’ll be in Mammoth June 19-28, as well as July 4 weekend, so perhaps we’ll cross paths with you out of Reds or Tuolomne. We will be hiking the PCT toward you on June 20 out of Reds. You should have spotty service in Reds (at least near the ranger station at Devil’s post pile there is the possibility of service – we got it last weekend). Call if you need help/transport into town. Margy (and Bill) 310-497-7443 cell. Hi Michael. Say that storm got me too. I was two days out on the Western States Tr. and got the heavy rain none stop from Tuesday night to all day Wednesday. I waited it out in my MLD tent for 14 hours and decided to call my wife to pick me up at Robinsons Flat along the trail. I wanted to make a thru hike out of it, but time restraints got in the way to complete it on time for I have appointments early Friday am and was afraid I would not make the dead line. Your doing great and that hard beaten crew your with look rough and tuff. There is always someone every year who has to show off his balls accidently wearing a kilt. I had one on the 08 PCT named Handle Bar who was Scottish descent. He wore the kilt on the AT,PCT and CDT every single day. In the heat it was cool but in the low 20s of course he froze his balls off. I noticed your hiker friend was cheating a little bit and that’s a good sign that he is not of Scottish heritage, just a show off. You can tell him that, ha ha. Marmot Dan will be at South Lake Tahoe June 15,16 and 17. I told him if he was up by Donner Summit I would pick him up only on those days. I leave for Hawaii on the 20th and got visitors arriving that week and it makes things too confusing to go all the way to South Lk Tahoe. Well, HAPPY TRAILS. Yeah, the storm nailed everyone. Enjoy Hawaii. thank you for the Group picture and Names. Now I can put a face to your words and how you describe your Group. Glad to hear your all doing good. My thoughts and prayers are with you each and every day. You’re little Sister misses you terribly and I love you!